This project explores the potential for compact inner city living. Located behind the wall of Hobart’s Liverpool Street façade, lay six single room apartments / studios, a small commercial space, car parking and a shared roof garden. On the smallest of footprints, the new architecture searches for spatial opportunities, light, and functionality. Contextual harmony is sought through an exchange between the contemporary forms of the new architecture and its heritage streetscape. Internally, light filters and reflects through from above via an internal light well to an inner urban oasis. 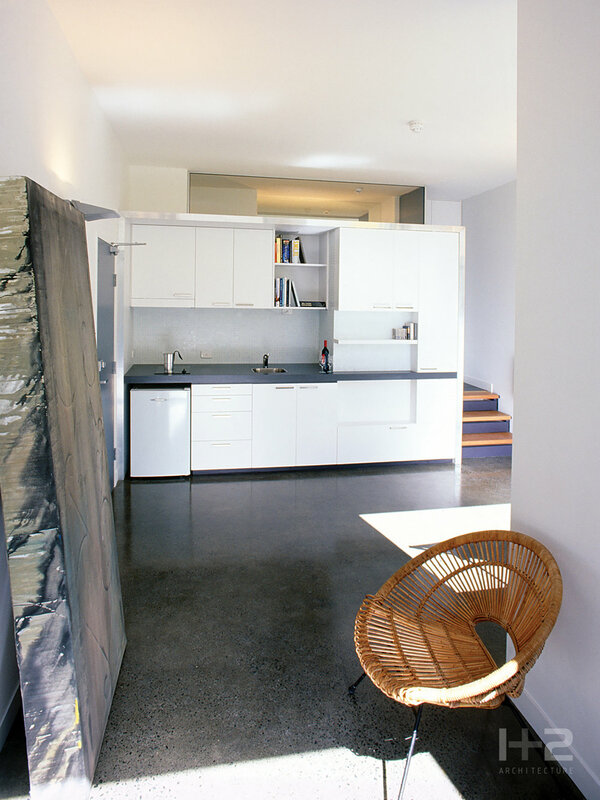 "Tucked behind a nineteenth century shop house façade in Hobart's CBD, a hint of colour and a bedside lamp are all that suggests the presence of the micro-scale studio apartments behind. Working within a tight budget and an even tighter building footprint, 1+ 2 Architecture have skilfully manipulated the insertion of six single room apartments, a retail gallery, car parking and a roof garden. The architecture is an exercise in refined but restrained detailing, maximising both perceptual and physical space through light, colour and joinery. Two vertical light shafts provide relief in the centre of the building. In one, a lightweight steel, glass and timber access stair rises from a mosaic tile plinth to reveal a generous communal terrace overlooking Liverpool Street. In the other, the inclusion of bi-fold windows and a wash of colour to an otherwise bare concrete surface create an unexpected warmth and tranquillity to the internal apartments. The simplicity of the spatial and planning solution is complemented by a restrained colour and material palette. Overall the jury was impressed by the control exercised by the architects in this challenging project demonstrating sophistication in spatial, material, constructional, servicing and financial solutions without over-indulging in architectural trickery."